Chaostle is a unique game in that it combines the fun of tabletop miniatures gaming and conventional board games. 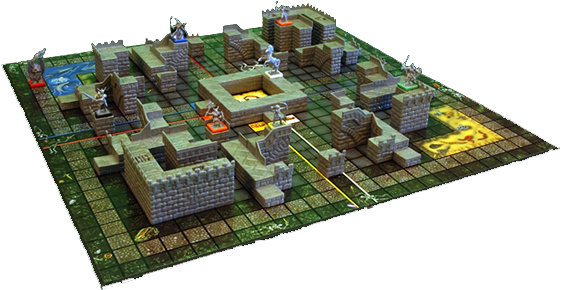 The structured multi-level castle game board provides many levels of strategy. The simplified and exciting battle system allows this game to be enjoyed by heavy game players as well as those who are new to miniature games. Chaostle has many levels of strategy from picking your starting army to moving throughout the multi-level castle towards victory. A game with pure strategy, however, would be just another chess game and not like real life where nothing ever goes as planned. Therefore, chaostle has many fates that constantly effect the game ranging from mild setbacks to cataclysmic earthquakes. These unpredictable twists of fate can be either from the card of happiness or the card of doom. 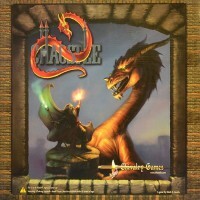 Chaostle features 23 three-dimensional castle walls that are secured onto the game board. The fantasy fighters can move any direction throughout the castle including up and down stairways to change levels. The castle sections were originally sculpted by Bruce Hirst of Hirst Arts. The game comes standard with sixteen collectible plastic miniature characters. Additional characters will be available and released in the future as add-ons to the game that will be sold separately. The first set of eight add-on characters will be available soon after the release of the game. Adding new characters to the game adds to the strategy and variety of game play. Each character has a battle card containing the character's statistics, weapons, special skills and upgrades. The battle cards have holes where pegs are inserted to allow for easy tracking of the statistics and upgrades. This a super rad game! I would call it a RPG/battle game. You fight against the other players as well as the game itself. You upgrade your characters by defeating the other players in battle and the goal is to be the first player to defeat the castle and make it inside. Best to have four, six or eight players and somewhere between two and eight hours to kill! There is a great expansion for this game as well, but they don’t seem to have it on this website. Add a Review for "Chaostle"